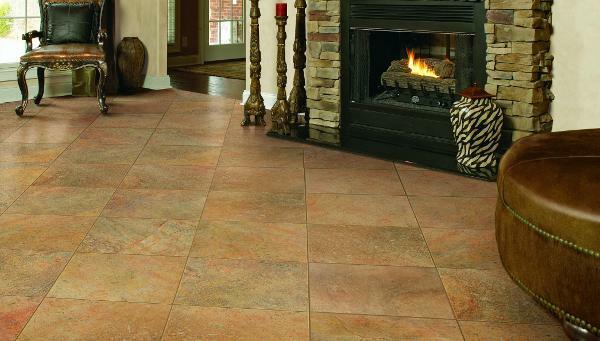 From bathroom to living room to bedroom, ceramic floor tile can be your flooring of choice for the whole house. 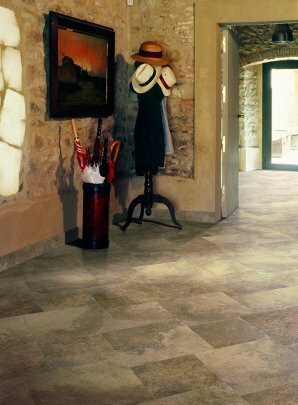 The versatility of ceramic tile can be seen in this picture as small ceramic multi-colored tiles are used to create a dramatic entry into the home. Larger tiles are employed around the perimeter of the media room. The ceramic floor tile delineates the room, acting as an extension of the partial wall that separates the entry from the media space. Notice how well the tile works adjacent to the wood flooring. In the Tile Styles section we discussed how technological advances have expanded tile textures. 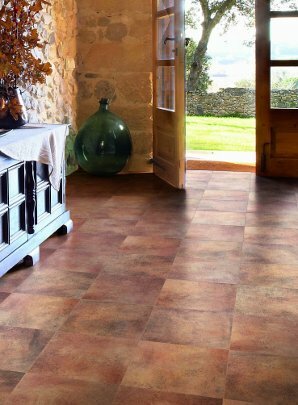 Many ceramic tiles now offer a wood look so you can use them in lieu of wood or laminate flooring. In this room, the warm earth-toned ceramic tiles compliment the rough stone walls and provide a perfect segue to the outdoors. It has an old world feel as though you’ve stepped back in time. From old world to brave new world and from the bedroom to the media room just below, the levels of tile add a clean, continuous flow by opening up the space. 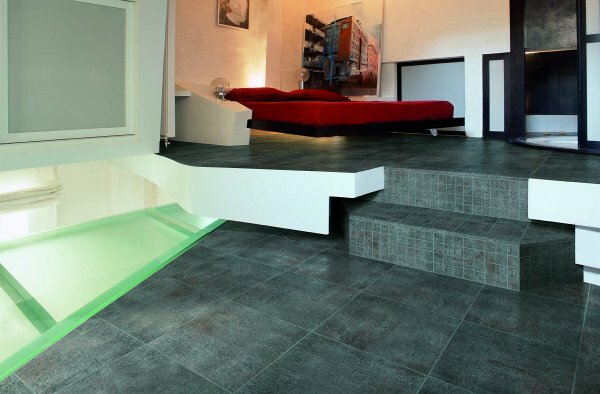 The small ceramic tiles define the steps while the 12x12 tiles give the rooms an expansive modern look. Ceramic tiles arranged diagonally form a diamond shape pattern that is visually pleasing while drawing your eye to the stone fireplace, the focal point of the room. The deep gold, orange and blue hues in the tile reflect the similar colored stones that surround the fire box and even the fire itself. All of these elements converge, creating a warm and inviting atmosphere. Go back to our floor tiles page.